It was a simple high-low card game, played out on TV for everyone at home. But it was good fun, and it always reminds me of my grandmother. 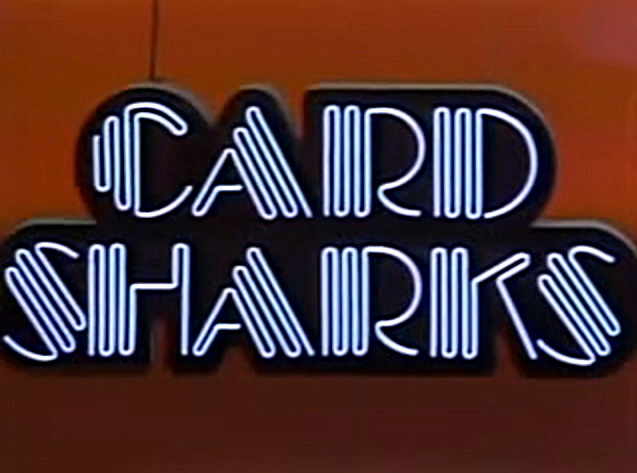 It was Card Sharks, and it aired on NBC from 1978 to 1981. My grandma used to tell me stories of her grandfather, a sign painter by trade and, according to her, a brilliant poker player. While her dad and his buddies played, she’d serve the drinks and empty the ashtrays — and watch her daddy carefully, trying to figure out his secrets. Maybe it was her close study, maybe it was genetics, but Grandma had an almost supernatural ability to know which card was next in any deck. When I’d visit my grandma, we often watched game shows together. When Card Sharks came on, she watched especially closely. And frequently, when a contestant would be sitting on a four of hearts and holler “Higher!” — Grandma would holler right back, “No! It’s a black two!” You would have done well to lay bets on those exclamations, because she was almost always right. Here’s the first ever episode of Card Sharks, from 1978. From my collection, here’s the Card Sharks theme “in the clear,” as they say, meaning you’ll hear the whole theme start to finish without any voiceovers. By the way, if you ever encounter me in a poker game, I warn you: my grandma taught me how to play! Vintage TV is an occasional series. See all the posts here. NBC aired the first color television program* in 1953, and you’d better believe they made a big deal of it. The network consistently had more color programming than CBS or ABC for some time. Starting in 1957, they preceded every color show with the famous NBC Peacock. That peacock lasted until 1962, when the one more widely known debuted. CBS got into the game, too, with its own bumper. It seemed staid and stuffy in comparison, but then again, everything CBS did seemed that way. By the early 1970s, all network programming was in color, and color bumpers began to disappear. A few shows on NBC, notably The Hollywood Squares and The Tonight Show, held on, keeping the peacock through the late 1970s. Maybe they were just nostalgic. *Okay, CBS actually beat NBC to the punch, airing its first commercial color program in 1951. But CBS did it using a system that required a special TV set with a wacky rotating color disk in front of the screen. People with regular black-and-white sets couldn’t see the show at all. The FCC adopted the NBC system, which was compatible with black-and-white sets, and CBS’s system became nothing more than a footnote. Like this one. If you liked this, you might also like to read about the CBS Late Movie and see how local TV was done in 1977.